Cairns single mum Nykita Anno says her son's chronic illness has been an inspiration throughout her Bachelor of Nursing degree through CQUniversity. "My four-year-old son has Osteogensis Imperfecta (brittle bone disease) and Autism type 2, which has been challenging as I've also been juggling study and work, but he has also pushed me to want a career in health," Nykita says. "My CQUniversity graduation day, the 2nd of April, coincided with Autism Awareness Week, where myself and my son wore blue to raise awareness on that day. "It was an incredible feeling to attend my recent graduation and to reach that milestone. "I'm now working for BlueCare community nursing doing home visits and I'm hopeful of becoming a community clinical nurse for BlueCare. "My Nursing studies were done as an external student who attended residential schools hosted by CQUniversity Cairns campus. "Throughout my course I made great connections with the other Nursing students and we met up after graduation ... we are hoping to keep that going and to make it an annual get-together." Nykita not only picked up her Nursing testamur but also an Indigenous sash, reflecting her Aboriginal and Torres Strait Islander heritage. 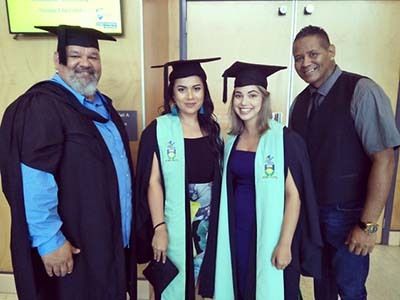 She says she was delighted to celebrate in Cairns alongside another Indigenous Nursing graduate, Porscha Broer. Nykita and Porscha are among half a dozen Indigenous Nursing graduates from CQUniversity in the month of April alone. Porscha also enjoyed the graduation day and was proud of the Indigenous sash component, reflecting her Torres Strait Islander heritage. "Thanks to my CQUni studies I know have a graduate nursing job at Cairns Hospital, in the Orthopaedic and Day Surgery area," she says. "After school I worked in health administration, exposing me to the prospects of a career in nursing, which also suits my desire to help people and the wider community."